Wood is an excellent fuel. It is plentiful, and renewable. It can often be sourced very close to the point of use and is nearly carbon neutral. Think of a piece of wood as a block of energy. In order for that energy to be turned into heat, it must be burned at the correct temperature. If it isn’t burned at the correct temperature, it will smoulder. This will result in very little/no heat being emitted. So it’s not only a waste of your money, but it also pollutes the environment. Most of what is burning when you use logs are “volatile hydrocarbons”. These take the form of tars, creosote and resins etc. They constitute about 70 – 80% of the available heat energy and are an excellent fuel. When we see flames coming from wood, it’s the volatile gasses that are burning. Most of the rest of the available energy is fixed carbon (charcoal) at around 15 – 18%. When we see wood and embers glowing, it is the fixed carbon that is burning. If the stove is not hot enough it’s the volatile tars etc. that can cause a problem. These volatile hydrocarbon compounds must first be turned in to a gas (vapourised) before they can burn. If the fire is not hot enough these volatile vapours are still given off but are not completely burned in the appliance and they escape to the chimney. If the chimney is cool enough, some of these vapours will condense and solidify on to the inside of the chimney in the same way that water vapour condenses on to a cool bathroom mirror. 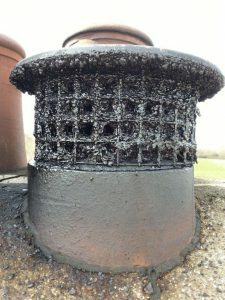 In a cool chimney they can immediately solidify to form the tarry deposits or creosote glaze which is a problem for all of us. Remember, smoke is simply unburned fuel. This is a serious air pollutant. Much of the available fuel which could have been turned into heat has also been lost. Incomplete or low temperature burning of wood is bad for your chimney (and can cause chimney fires), bad for air quality and bad for your wallet. Very tarry bird guard on chimney top. Lots of unnecessary air pollution was released to make the guard this bad.